We would like to share information about the following topics: Wear Blue on April 2nd in Support of Autism Awareness; Update on Proposed New Middle School Buildings – Frequently Asked Questions; This Week’s Cones for Excellence in Building Student Pathways Recognition – Ms. Destefano (Morgan School); HHS Adaptive Physical Education Program Skates into its 18th Year; MCAS Testing; Importance of Current Vaccinations/ Immunizations; Enroll Your Student – Early Childhood, Extended School Year, Dual Language and Middle School Choice Programs; April Vacation Academy; Panorama Culture and Climate Surveys for Families; Upcoming Events; and News Briefs. April 2nd is Autism Awareness Day. In honor and support of HPS students with autism, we invite you to wear blue. Take a picture and send it to us at webmanager@hps.holyoke.ma.us and we’ll share it on our social accounts. Save the Date – We hope that you can join us on April 10th at 6 PM at the Holyoke Senior Center for a presentation about the proposed construction of new middle school buildings in Holyoke. Why is Holyoke considering building two new middle schools? For many years now community members and faculty have expressed a desire to establish new schools specifically designed for this age group and their developmental needs. While the District is steadily improving educational outcomes at the elementary and high school levels, the middle school results continue to lag in educational achievement, attendance, staff turnover and other important measures. Consolidating the middle school students into two buildings will help the District replace older, worn out buildings, will reduce congestion in the elementary schools, and will reduce overall District operating costs. The proposed plan calls for a new 550 student middle school replacing Peck and a second 550 student school at the corner of Chestnut and Cabot Streets. I am a renter. Am I allowed to vote? How big will the new schools be? Each new middle school will be roughly 106,000 square feet in size. That is two-thirds (2/3) the size of the current Peck School and a little less than twice as large as Lawrence School. The first floor will contain cafeteria, gym, administration, music, library and other large spaces. The three upper floors will each support a single grade level divided into two communities of 90 students each. Will there be middle school enrichment programs? Yes, the new schools will include for arts and music programs. There will be also be a new STEM lab, a learning commons, a new gym, better outdoor spaces, and an exercise/dance classroom. The combined project cost is $131 million, of which the City will pay $55 million. The State will pay $76 million through the Massachusetts School Building Authority (MSBA). The current proposal is to borrow for the City’s share over a 30 year period. The voters of the City have to approve this plan by a majority vote because it will increase the tax rate for commercial and residential property owners for the period of the debt payment. The City can pay down that debt faster as other revenue becomes available. What will this cost me as a homeowner or business owner (per $100,000)? Will new middle schools improve the educational outcomes of the District? There are many reasons to believe that new schools will improve the District’s overall educational success. Studies show that new and modernized educational facilities improve results on cognitive performance tests and standardized tests and reduce staff turnover rates. Much of that improvement is attributed to increased attendance and decreased drop- out rates, lower rates of asthma and respiratory illness . Better daylighting, air quality and acoustic performance each contribute to improved learner performance, but also reduce the stress on teachers and improve staff satisfaction. This project also aims to improve the social and emotional environment in which children learn. The plan works to establish better relationships between teachers and students by organizing grade level clusters for team teaching. It encourages inclusion and differentiated instruction by offering larger classrooms and by placing support spaces closer to the classroom. It includes collaboration spaces, de-escalation spaces and offices for academic coaches near classrooms. It encourages healthier relationships to nature by including green walls, views of the outdoors, good daylighting, operable windows, a green roof and natural wood finishes in the classroom. Finally, the schools will include updated teaching technology including a laptop per student, a new STEM lab, new sinks and water fountains in every classroom, and a dedicated resource area to welcome and support families. Why not a single school for 1,100 students? This option was studied by the Building Committee and District staff but discarded in favor of two mid-size middle schools. Mid-size middle schools establish a learning community through strong adult-student relationships and variety in class offerings. Having two middle school buildings allows for all students in Holyoke to have access to this state-of-the-art learning environment. When will the new schools open? If the project is approved by the voters in June 2019, students will be moved out of Peck in the Fall 2020 and relocated in swing space in the District or in a rented space. The construction of the new schools will take 22 months. Both schools will open in Fall 2022. Will the community be able to use the schools after hours? Yes, the schools will be air-conditioned and designed to support secure community use in the evenings and year round. What if the City votes against the project? If the voters reject the proposal to build two new middle schools, Holyoke will forfeit access to the $75M offered to the project by the MSBA. If the District decides to submit another project for consideration to the MSBA, it will have to start the entire process of submitting another project request and paying for another feasibility study and vote. In the meantime, schools that are already identified as in need of critical repairs or replacement will continue to be used as teaching facilities. The District will have to make do with these facilities while trying to establish a middle school structure. How can I learn more or get involved? Reach out to the Design Team at Jones Whitsett Architects by emailing db@joneswhitsett.com or visit https://www.hps.holyoke.ma.us/turnaround/msredesign/. We are eager to continue our improvement efforts to better serve the students and families of Holyoke and we look forward to your continued support. This week’s Cones for Excellence recognition was presented to Ms. Destefano (Educational Team Leader, Morgan School). In her short time in HPS, Ms. Destefano has made a strong and positive impact. She is flexible, open-minded and above all, embraces our families and students as her own. We thank her for her many contributions! In the Holyoke Public Schools, we are recognizing one educator a week who is working hard to build and grow our students’ ability to: effectively communicate, think critically, productively engage as community members and become mindful individuals (from our graduate profile). We are surprising a deserving HPS educator with a construction cone that displays the words: “Awesome”, “Well Done”, and “Great Job”. To date, the following HPS educators have received an honorary Cone for Excellence: David Rudzik (Metcalf School); Darlene Henshaw (Holyoke High), Ms. Casey Doreums (Lawrence School), Frederick Caswell, (Peck School), Tammy Cato (5th-grade teacher at EN White), Roberto Vicente, Jariela Cruz Caliz (Middle school alternative teacher), Trish Wilson (Donahue School), Odalis Acevedo (Metcalf School), Amy Nill (Peck School), Dr. Laura Chiaravalloti (Holyoke STEM Academy), and Laura Vazquez (Holyoke High School North Campus). These educators also receive an ice cream cone gift certificate, donated by Friendly’s, in recognition for their outstanding work. Congratulations to these educators who are focused on providing a high-quality educational experience and offering multiple pathways for students to succeed. This morning, the celebration of the 18th Annual Holyoke High School Adaptive Physical Education Skating Program took place at the Fitzpatrick Arena (575 Maple Street, Holyoke, MA). Over thirty students enjoyed skating, including those from our RISE and Shine Program as well as Holyoke High School student volunteers (peer partners). Handicapped-equipped skate sleds and walkers were used to facilitate skating for some of the students. 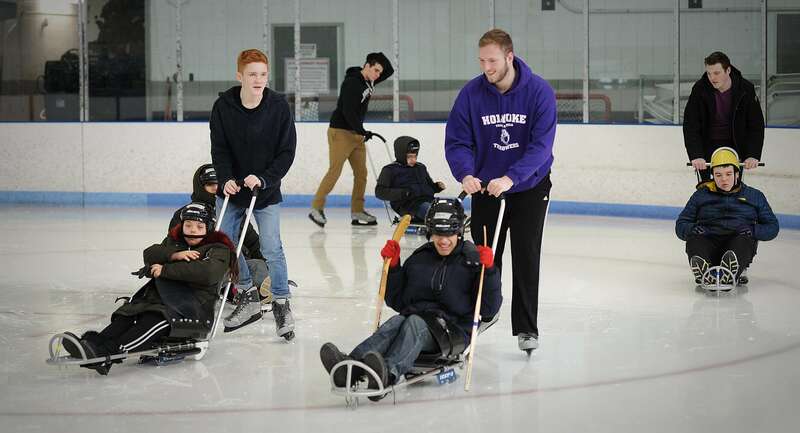 This 8-10-week program that occurs during the winter months gives students the opportunity to make new friends while enjoying the benefits of exercise from skating. Click here to view a video of the program in action. Letters to families have recently been sent home to families regarding the administration of MCAS assessments. They are also posted to each school webpage along with the MCAS schedule. Click here and visit your child’s school webpage for more information. At the high school level, MCAS is a graduation requirement for students. Strong results can also earn students valuable scholarships to Massachusetts colleges and universities. The next-generation MCAS tests are an updated version of the previous MCAS tests and are given on a computer instead of on paper (unless students have special needs that require a paper test). Students in grades 3 through 8 have been taking the next-generation tests since 2017. This spring, students in grade 10 (the class of 2021) will be the first class to take the next-generation high school tests in ELA and mathematics. The next-generation tests have different score ranges and achievement levels than the previous tests: the new scale is 440–560 points, and the new achievement levels are Exceeding Expectations, Meeting Expectations, Partially Meeting Expectations, and Not Meeting Expectations. The minimum score needed to pass the next-generation MCAS will be set at a level equivalent to the passing score on the previous MCAS for this year’s sophomores and for students who are now freshmen (members of the classes of 2021 and 2022). If students don’t pass the Next-Generation Grade 10 MCAS Tests in English Language Arts and Mathematics, there are two retest opportunities per year in both subjects, so students can take the retests in grades 11 and 12 and beyond if necessary. Please encourage students to bring their best and support them to get plenty of rest the nights before exams, to arrive on time on exam days, to answer each and every question as thoroughly as possible and to check their answers at least once before finishing the test. Thank you for helping us make MCAS run smoothly so students can focus on bringing their best efforts. Please join us in encouraging them and reminding them that giving this assessment their best opens opportunities and enables teachers to better help them succeed. Keeping your family’s vaccines current can help protect you and your children from our country’s current outbreak of vaccine-preventable diseases. Diseases such as measles, mumps, whooping cough, and chickenpox are very real risks for un- or under-vaccinated individuals. Our schools’ nurses urge you to contact your health care provider and schedule an immunization appointment for your child if they are behind or missing some immunizations. In the US, nearly 90,000 people die each year from vaccine-preventable diseases. We know that vaccines save lives. On-time vaccination throughout childhood is important because it helps provide immunity before children are exposed to diseases that could potentially be life-threatening. Vaccines are tested to ensure that they are safe and effective for children to receive at the recommended ages. Contact your child’s school nurse for more information. We are now accepting Applications for the 2019-2020 School Year. Click here to visit our Enrollment webpage for applications, deadlines, and program information! This just in… There will be an Honors Arts Vacation Academy at Donahue School for students from McMahon and Donahue in grades 5-8. Holyoke Public Schools and ENCHANTED CIRCLE will be offering an Honors Arts April Vacation Academy. In this 4-day Arts Exploration Academy students in Grades 5-8 will have the opportunity to experience Digital Media, Musical Theater, 2D/3D Visual Arts, Latin, and Caribbean Dance, Bucket Drumming, and community choice time where students can engage in outdoor sports and cooperative group games. The week will conclude with a culminating sharing of art experiences and demonstration of skills, and an ice cream social. Click here to view the flyer. | Click here to register your student, o aquí en Español. We are pleased to offer the nationally-acclaimed Camp Inventions program to children in second through fifth grade (Monday-Thursday, April 15-18, 2019 from 8:30 AM – 3:00 PM). It’s an exciting, four-day Vacation Academy adventure with lessons that will allow students to explore the connections between science, technology, engineering and innovation. Children will work together to create solutions to real-world problems and build critical STEM skills while working through several high-energy, hands-on activities. Breakfast and lunch will be provided. Click here to register your student. Check out the flyer | en Español. Students will be notified of acceptance to the program by April 1st, 2019. For questions, please feel free to contact: Director: Michelle Macklin mmacklin@hps.holyoke.ma.us or Asst. Director: Sam Garcia sagarcia@hps.holyoke.ma.us. Families, to ensure timely communication with you at home, and keep you informed and updated about all that is happening in our schools, we ask that you update the school when you have a change in contact information (phone numbers, street and email addresses, names of emergency contacts). For your convenience, here is the contact information for all of HPS: www.hps.holyoke.ma.us/schools/. Thank you for partnering with us to ensure that we have the correct and updated information for your child and can communicate with you promptly and effectively. The Holyoke Public School district is surveying our families using the Panorama Culture and Climate Survey. The survey data will inform our improvement efforts at the school and district level, as we work together to be families’ first choice for their children’s education. The 2019 survey window has been extended to March 29th. We ask that you please take 5-7 minutes to complete the family survey using this link:https://surveys.panoramaed.com/holyoke and https://surveys.panoramaed.com/holyoke/login?language=es for Spanish and entering the access code for your school listed below. The access codes are the same for English and Spanish. For more information about the surveys, please contact Jenny Malave, Project Manager at jmalave@hps.holyoke.ma.us. Visit the homepage on our website to access the district’s family events calendar that has been created to inform the HPS community of upcoming family events, that are taking place in the district. The calendar also includes school vacation, professional development days, graduation dates, and holidays. It is also located on our Calendars, Bell times, and Events webpage, at the following url: https://www.hps.holyoke.ma.us/families/calendars/. Bunny HOP for Donahue families from 5:00 – 9:00 at Donahue School, 210 Whiting Farms Rd. ABL Bingo for Book Fundraiser from 5:00-6:30 at Maurice A. Donahue Elementary School, 210 Whiting Farms Rd. Parent Power Math Expo – Empowering our Children’s Math Learning from 10:00am—2:00 pm at Holyoke High School, 500 Beech Street. This event is open to HPS students of all ages and their families. The event will feature workshops, a Robot-Themed Escape Room, a Slime Room, a STEM Room and more. Exciting news! The high school now offers a Seal of Biliteracy for eligible students who are fluent and literate in English and any other language. This is part of the district-wide effort to cultivate biliteracy in our k-12 students to give them access to the best opportunities. Addams Family Shoutout – Congratulations to the Holyoke High School team for their hard work and delivery of another spectacular musical performance. Thank you to all who supported our students and staff. It truly takes a community effort to yield such a success. What talent we have here in Holyoke! Stay tuned for the highlight video which will be posted to our district Facebook page. The St. Patrick’s Day Parade float constructed by HHS Dean Campus students was awarded Second Prize for Irish Theme , the John T. Sheehan Memorial Award to the Holyoke Parade Committee Grand Colleen Float “Emma’s Cottage”. Congratulations to the students and staff who worked so hard on this project! Check out photos of some of the HPS contingent in The Holyoke Sun. Sheriff Nick Cocchi visited McMahon School on Friday with his therapy dog Brooklyn. While he was there he swore in students as honorary sheriff deputies. Morgan super heros dominate MCAS! Starting from this past Friday through the end of MCAS, Morgan School is having a superhero theme to support their 3rd and 4th graders taking the MCAS. They’ve all been working together to get their students excited about attacking the test. Check out the school’s Facebook page, Morgan Jags, for more pictures! I Touched A Brain! – students had a chance to touch/observe sheep brains while educators led a discussion about the broad functions of certain brain regions and what might happen if there was damage to those brain regions (including talking about the importance of using helmets and what happens when someone gets a concussion). Train Your Friends! – students used the premise of “operant conditioning” (a technique often used in animal research about cognition and motivation) to train a peer on how to accomplish a certain task using positive reinforcement rather than explicit directions. They learned about dopamine and reinforcement learning, as well as the concept of “neurons that fire together wire together” to discuss how practice helps you learn a new task. The Synapse Game! – students played a special game of catch with bean bags as a way to learn about chemical synaptic signaling. They learned how alcohol, nicotine, and Parkinson’s Disease impact how our neurons communicate. Go To Sleep! – students tried on EEG caps, learned about how to measure brain waves, and discussed how we to use this information to study sleep and memory. They learned why sleep is important, especially during adolescence. Conversation with Author Series With Massachusetts Commissioner of Higher Education Carlos Santiago, Friday, April 19, 2019 at 5:00 pm at the Holyoke Public Library – Massachusetts Commissioner of Higher Education, Carlos Santiago has just released a new edition of his book, Puerto Ricans in the United States: A Contemporary Portrait, which provides “a comprehensive, contemporary portrait of the nearly 8 million Puerto Ricans almost evenly divided between the island itself and across the U.S. mainland and Hawaii”. We hope you have an enjoyable end of the week. Quisiéramos compartir información sobre los siguientes temas: Use Azul el 2 de Abril en Apoyo a la Conciencia del Autismo; Actualización sobre la Construcción Propuesta de Dos Nuevas Escuelas Intermedias – Preguntas Frecuentes; El Cono por Reconocimiento a la Excelencia en la Construcción de Caminos Estudiantiles fue presentado a Ms. Destefano (Escuela Morgan); El Programa de Educación Física Adaptativa de la Escuela Holyoke High patina hasta su 18º año; Pruebas MCAS; Importancia de las Vacunas / Inmunizaciones Actuales; RECORDATORIOS – Inscriba su estudiante hoy – Programas de opciones para la Primera Infancia, Año Escolar Extendido, Dos Idiomas, y Escuela Intermedia; Academia de Vacaciones de Abril; Panorama Cultural y Encuestas de Clima para Familias; Próximos Eventos; y Noticias Breves. El martes 2 de abril es el Día de la Concienciación sobre el Autismo. En honor y apoyo a los estudiantes con autismo de HPS, te invitamos a vestir azul. Tome una foto y envíenosla a webmanager@hps.holyoke.ma.us y la compartiremos en nuestras cuentas sociales. Guarda la Fecha – Esperamos que pueda unirse a nosotros el 10 de abril a las 6 PM en el Centro de Adultos Mayores de Holyoke para una presentación sobre la construcción propuesta de los nuevos edificios de escuelas intermedias en Holyoke. ¿Por qué Holyoke está considerando construir dos nuevas escuelas intermedias? Durante muchos años, los miembros de la comunidad y la facultad han expresado el deseo de establecer nuevas escuelas diseñadas específicamente para este grupo de edad y sus necesidades de desarrollo. Si bien el Distrito está mejorando constantemente los resultados educativos en los niveles de primaria y secundaria, los resultados de la escuela intermedia continúan retratándose en el logro educativo, la asistencia, la rotación de personal y otras medidas importantes. La consolidación de los estudiantes de la escuela intermedia en dos edificios ayudará al Distrito a reemplazar edificios antiguos y desgastados, reducirá la congestión en las escuelas primarias y reducirá los costos operativos generales del Distrito. El plan propuesto contempla una nueva escuela intermedia para 550 estudiantes que reemplaza a la Escuela Peck y una segunda escuela para 550 estudiantes en la esquina de las calles Chestnut y Cabot. Soy un inquilino ¿Se me permite votar? Sí. Todos los residentes de Holyoke registrados para votar serán elegibles para votar. ¿Qué tan grandes serán las nuevas escuelas? Cada nueva escuela intermedia tendrá un tamaño aproximado de 106,000 pies cuadrados. Eso es dos tercios (2/3) del tamaño de la actual Escuela Peck y un poco menos del doble que la Escuela Lawrence. El primer piso contendrá cafetería, gimnasio, administración, música, biblioteca y otros espacios grandes. Los tres pisos superiores apoyarán cada uno un nivel de grado dividido en dos comunidades de 90 estudiantes cada una. ¿Habrá programas de enriquecimiento de la escuela intermedia? Sí, las nuevas escuelas incluirán programas de arte y música. También habrá un nuevo laboratorio STEM, un centro de aprendizaje, un nuevo gimnasio, mejores espacios al aire libre y un salón de clases de baile y ejercicio. El costo combinado del proyecto es de $131 millones, de los cuales la Ciudad pagará $55 millones. El estado pagará $76 millones a través de la Autoridad de Construcción de Escuelas de Massachusetts (MSBA). La propuesta actual es pedir prestado para la parte de la Ciudad durante un período de 30 años. Los votantes de la Ciudad tienen que aprobar este plan por mayoría de votos porque aumentará la tasa impositiva para los propietarios de propiedades comerciales y residenciales durante el período del pago de la deuda. La Ciudad puede pagar esa deuda más rápido a medida que otros ingresos estén disponibles. ¿Cuánto me costará esto como propietario de una casa o dueño de un negocio (por $100,000)? ¿Las nuevas escuelas intermedias mejorarán los resultados educativos del Distrito? Hay muchas razones para creer que las nuevas escuelas mejorarán el éxito educativo general del Distrito. Los estudios demuestran que las instalaciones educativas nuevas y modernizadas mejoran los resultados en las pruebas de rendimiento cognitivo y las pruebas estandarizadas y reducen las tasas de rotación del personal. Gran parte de esa mejora se atribuye al aumento de la asistencia y la disminución de las tasas de deserción, las tasas más bajas de asma y enfermedades respiratorias. Una mejor iluminación natural, la calidad del aire y el rendimiento acústico contribuyen a mejorar el rendimiento del alumno, pero también reducen el estrés en los maestros y mejoran la satisfacción del personal. Este proyecto también tiene como objetivo mejorar el entorno social y emocional en el que los niños aprenden. El plan trabaja para establecer mejores relaciones entre maestros y estudiantes mediante la organización de grupos de nivel de grado para la enseñanza en equipo. Fomenta la inclusión y la instrucción diferenciada al ofrecer salones de clases más grandes y al colocar espacios de apoyo más cerca del salón de clases. Incluye espacios de colaboración, espacios de desescalada y oficinas para entrenadores académicos cerca de las aulas. Fomenta las relaciones más sanas con la naturaleza al incluir paredes verdes, vistas del exterior, buena iluminación natural, ventanas operables, un techo verde y acabados de madera natural en el aula. ¿Por qué no una sola escuela para 1.100 estudiantes? Esta opción fue estudiada por el Comité de Construcción y el personal del Distrito, pero se descartó en favor de dos escuelas intermedias de tamaño medio. Las escuelas intermedias medianas establecen una comunidad de aprendizaje a través de sólidas relaciones entre adultos y estudiantes y una variedad de ofertas de clase. Tener dos edificios de escuelas intermedias permite que todos los estudiantes en Holyoke tengan acceso a este entorno de aprendizaje de vanguardia. ¿Cuándo abrirán las nuevas escuelas? Si el proyecto es aprobado por los votantes en junio de 2019, los estudiantes se mudarán de Peck en el otoño de 2020 y se reubicarán en un espacio columpio en el Distrito o en un espacio alquilado. La construcción de las nuevas escuelas llevará 22 meses. Ambas escuelas abrirán en el otoño de 2022. ¿Podrá la comunidad usar las escuelas después de las horas? Sí, las escuelas tendrán aire acondicionado y estarán diseñadas para apoyar el uso seguro de la comunidad en las tardes y durante todo el año. ¿Qué pasa si la Ciudad vota en contra del proyecto? Si los votantes rechazan la propuesta de construir dos nuevas escuelas intermedias, Holyoke perderá el acceso a los $75 M ofrecidos por MSBA al proyecto. Si el Distrito decide enviar otro proyecto para su consideración a la MSBA, tendrá que comenzar todo el proceso de enviar otra solicitud de proyecto y pagar otro estudio de viabilidad y votar. Mientras tanto, las escuelas que ya están identificadas como necesitadas de reparaciones críticas o reemplazo seguirán siendo utilizadas como instalaciones de enseñanza. El Distrito tendrá que conformarse con estas instalaciones al tratar de establecer una estructura de escuela intermedia. ¿Cómo puedo aprender más o involucrarme? Póngase en contacto con el Equipo de Diseño de Jones Whitsett Architects por correo electrónico db@joneswhitsett.com o visita https://www.hps.holyoke.ma.us/turnaround/msredesign/. El reconocimiento de Conos para Excelencia de esta semana se presentó a la Srta. Destefano ((Líder del Equipo Educativo, Escuela Morgan). En su corto tiempo en HPS, la Srta. Destefano ha tenido un impacto fuerte y positivo. Es flexible, de mentalidad abierta y, sobre todo, abraza a nuestras familias y estudiantes como propios. ¡Le damos las gracias por sus muchas contribuciones! En las Escuelas Públicas de Holyoke (HPS por sus siglas en inglés), estamos reconociendo un educador por semana que está trabajando arduamente para construir y hacer crecer la capacidad de nuestros estudiantes para: comunicarse efectivamente, pensar de manera crítica, participar productivamente como miembros de la comunidad y convertirse en individuos conscientes (de nuestro perfil de graduados). Estamos sorprendiendo a un educador de HPS merecedor con un cono de construcción que muestra las palabras: “Impresionante”, “Bien hecho” y “Gran trabajo”. Hasta la fecha, los siguientes educadores de HPS han recibido un Cono de Excelencia honorífico: David Rudzik (Escuela Metcalf), Darlene Henshaw (HHS Campus Norte), Srta. Casey Doreums (Escuela Lawrence) , Frederick Caswell (Escuela Peck), Tammy Cato, (maestra de quinto grado en EN White), Roberto Vicente (escuela Kelly), Jariela Cruz Caliz (Maestra alternativa de la escuela intermedia), Trish Wilson (Escuela Donahue), Odalis Acevedo (Escuela Metcalf), Amy Nill (Escuela Peck), Dra. Laura Chiaravalloti (Academia STEM de Holyoke) y Laura Vázquez (Escuela Holyoke High Campus Norte). Estos educadores también reciben un certificado de regalo de cono de helado, donado por Friendly’s, en reconocimiento a su excelente trabajo. Felicitaciones a estos educadores que están enfocados en brindar una experiencia educativa de alta calidad y ofrecer múltiples vías para que los estudiantes tengan éxito. Esta mañana, la celebración del 18º Programa Anual de Patinaje Sobre Educación Física Adaptativa de la Escuela Holyoke High se llevó a cabo en el Arena Fitzpatrick (575 de la calle Maple, Holyoke, MA). Más de treinta estudiantes disfrutaron del patinaje, incluidos los de nuestro programa RISE y Shine, así como los estudiantes voluntarios de la Escuela Holyoke High (socios de pares). Se utilizaron trineos y andadores para discapacitados equipados para facilitar el patinaje de algunos de los estudiantes. Este programa de 8 a 10 semanas que se realiza durante los meses de invierno les brinda a los estudiantes la oportunidad de hacer nuevos amigos mientras disfrutan de los beneficios del ejercicio del patinaje. Haga clic aquí para ver un video del programa en acción. Cartas a las familias se enviaron recientemente a las familias con respecto a la administración de las evaluaciones de MCAS. También se publican en la página web de cada escuela junto con el calendario de MCAS. Haga clic aquí y visite la página web de la escuela de su hijo para obtener más información. En el nivel de escuela secundaria, MCAS es un requisito de graduación para los estudiantes. Los buenos resultados también pueden hacer que los estudiantes obtengan becas valiosas para los colegios y las universidades de Massachusetts. Las pruebas MCAS de la próxima generación son una versión actualizada de las pruebas MCAS anteriores y se administran en una computadora en lugar de en papel (a menos que los estudiantes tengan necesidades especiales que requieran una prueba de papel). Los estudiantes en los grados 3 a 8 han estado tomando los exámenes de próxima generación desde 2017. Esta primavera, los estudiantes en el grado 10 (la clase de 2021) será la primera clase en rendir los exámenes de la escuela secundaria de próxima generación en ELA y matemáticas. Las pruebas de la próxima generación tienen diferentes rangos de puntuación y niveles de logro que las pruebas anteriores: la nueva escala es de 440 a 560 puntos, y los nuevos niveles de rendimiento son Superando las Expectativas, Cumpliendo las Expectativas, Parcialmente Cumpliendo las Expectativas, y No Cumpliendo las Expectativas. La puntuación mínima necesaria para aprobar el MCAS de la próxima generación se establecerá en un nivel equivalente al puntaje de aprobación en el MCAS anterior para los estudiantes de segundo año de la escuela secundaria de este año y para los estudiantes que ahora son estudiantes de primer año de la escuela secundaria (miembros de las clases de 2021 y 2022). Si los estudiantes no aprueban los Exámenes MCAS de Próxima Generación para el grado 10 en Artes del Lenguaje en Inglés y Matemáticas, hay dos oportunidades de reevaluación por año en ambas materias, por lo que los estudiantes pueden tomar las reevaluaciones en los grados 11 y 12 y más si es necesario. Por favor anime a los estudiantes a que traigan lo mejor y les ayuden a descansar lo suficiente las noches antes de los exámenes, a que lleguen a tiempo los días de examen, a responder todas las preguntas lo más detalladamente posible y a verificar sus respuestas al menos una vez antes de terminar el examen. Gracias por ayudarnos a hacer que el MCAS funcione sin problemas para que los estudiantes puedan concentrarse en hacer todo lo posible. Únase a nosotros para animarlos y recordarles que dar a esta evaluación sus mejores oportunidades abre y permite que los maestros los ayuden a tener más éxito. Mantener actualizadas las vacunas de su familia puede ayudar a protegerlo a usted y a sus hijos del brote actual de enfermedades prevenibles por vacunación en nuestro país. Las enfermedades como el sarampión, las paperas, la tos ferina y la varicela son riesgos muy reales para las personas no vacunadas o no vacunadas. Las enfermeras de nuestras escuelas lo instan a ponerse en contacto con su proveedor de atención médica y programar una cita de vacunación para su hijo si están atrasados o faltan algunas vacunas. En los Estados Unidos, casi 90,000 personas mueren cada año por enfermedades prevenibles por vacunación. Sabemos que las vacunas salvan vidas. La vacunación a tiempo durante la infancia es importante porque ayuda a proporcionar inmunidad antes de que los niños estén expuestos a enfermedades que podrían ser potencialmente mortales. Las vacunas se prueban para garantizar que sean seguras y efectivas para que los niños las reciban a las edades recomendadas. Póngase en contacto con la enfermera de la escuela de su hijo para obtener más información. Estamos aceptando solicitudes para el Año Escolar 2019-2020. ¡Haga clic aquí para visitar a nuestra página web de inscripción para ver las solicitudes, los plazos y la información del programa! Esto acaba de llegar… Habrá una Academia de Vacaciones de Arte de Honores en la Escuela Donahue para estudiantes de las Escuelas McMahon y Donahue en los grados 5-8. Las Escuelas Públicas de Holyoke y ENCHANTED CIRCLE ofrecerán una Academia de Vacaciones de Abril de los Artes Honores. En esta Academia de Exploración de Arte de 4 días, los estudiantes en los grados 5-8 tendrán la oportunidad de experimentar los Medios Digitales, Teatro Musical, Artes Visuales 2D / 3D, Baile Latino y Caribeño, Tamborileo de Cangilones y tiempo de elección comunitaria donde los estudiantes pueden participar en actividades al aire libre y los juegos grupales deportivos y cooperativos. La semana concluirá con un intercambio culminante de experiencias artísticas y demostraciones de habilidades, y un evento social de helado. Click here to view the flyer. | Click here to register your student, o aquí en Español. Nos complace ofrecer el programa de Inventos de Campamento, aclamado a nivel nacional, para niños de segundo a quinto grado (Academia de Vacaciones de Abril se llevará a cabo de lunes a jueves, del 15 al 18 de abril de 2019 de 8:30 a.m. a 3:00 p.m.). Es una emocionante aventura de cuatro días de Academia de Vacaciones con lecciones que les permitirán a los estudiantes explorar las conexiones entre ciencia, tecnología, ingeniería e innovación. Los niños trabajarán juntos para crear soluciones a los problemas del mundo real y desarrollar habilidades STEM críticas mientras trabajan en varias actividades prácticas de gran energía. Se proveerá desayuno y almuerzo. Haga clic aquí para inscribir a su estudiante. Consulte el folleto | en Español. Los estudiantes serán notificados de su aceptación al programa antes del 1 de abril de 2019. Si tiene alguna pregunta, no dude en comunicarse con: Directora Michelle Macklin mmacklin@hps.holyoke.ma.us o a la Directora Asistente Sam Garcia sagarcia@hps.holyoke.ma.us. Familias, para asegurar una comunicación oportuna con usted en su hogar, y mantenerlo informado y actualizado sobre todo lo que está sucediendo en nuestras escuelas, le pedimos que actualice la escuela cuando cambie la información de contacto (números de teléfono, direcciones de correo electrónico y de la calle). nombres de contactos de emergencia). Para su comodidad, aquí está la información de contacto de todos los HPS: www.hps.holyoke.ma.us/schools/. Gracias por asociarse con nosotros para garantizar que tengamos la información correcta y actualizada para su hijo y que podamos comunicarnos con usted de manera rápida y eficaz. El distrito de las Escuelas Públicas de Holyoke está encuestando a nuestras familias utilizando la Encuesta Panorama de Cultura y Clima. La información de la encuesta informará nuestros esfuerzos de mejora a nivel escolar y distrital, ya que trabajamos juntos para ser la primera opción de las familias para la educación de sus hijos. La ventana de la encuesta de 2019 es del 25 de febrero al 29 de marzo de 2019. Le pedimos que tome de 5 a 7 minutos para completar la encuesta familiar usando este enlace https://surveys.panoramaed.com/holyoke/login?language=es e ingrese el código de acceso para su escuela que se indica a continuación. Los códigos de acceso son los mismos para inglés y español. Para obtener más información acerca de las encuestas, comuníquese con Jenny Malave, Gerente de Proyecto en jmalave@hps.holyoke.ma.us. Visite la página de inicio en nuestro sitio web para acceder al calendario de eventos familiares del distrito para informar a la comunidad de HPS de los próximos eventos familiares que se están llevando a cabo en el distrito. El calendario también incluye vacaciones escolares, días de desarrollo profesional, fechas de graduación y días festivos. También se ubica en la página Calendarios, Tiempos de Campana, y Eventos webpage, y con el siguiente vínculo: https://www.hps.holyoke.ma.us/familias/calendarios/. Poder de los Padres – Empoderando el Aprendizaje de Matemáticas de Nuestros Niños de 10:00 am—2:00 pm en la HHS Campus Norte, 500 de la calle Beech. Este evento está abierto a estudiantes de HPS de todas las edades y contará con talleres, una sala de escape con Temática de Robots, una Sala de Limo, una Sala STEM y más. ¡Buenas noticias! La escuela secundaria ahora ofrece un Sello de Alfabetización Bilingüe para estudiantes elegibles que dominan el inglés y cualquier otro idioma. Esto es parte del esfuerzo del distrito por cultivar la alfabetización bilingüe en nuestros estudiantes de grados K-12 para darles acceso a las mejores oportunidades. Presentación sobre el Estado de las Escuelas: si no pudo asistir a la reciente presentación sobre el Estado de las Escuelas, puede hacer clic aquí para ver un video de la presentación, haga clic aquí para acceder a PowerPoint. Addams Family – Felicitaciones al equipo de la Escuela Holyoke High por su arduo trabajo y la entrega de otra espectacular actuación musical. Gracias a todos los que apoyaron a nuestros estudiantes y personal. Realmente se necesita un esfuerzo de la comunidad para lograr tal éxito. ¡Qué talento tenemos aquí en Holyoke! Manténgase atento al video más destacado que se publicará en la Página Facebook de nuestro distrito. La Carroza del Desfile del Día de San Patricio, construida por los estudiantes del Campus Dean de la Escuela Holyoke High, recibió el Segundo Premio por Tema Irlandés, el Premio John T. Sheehan en Memoria al Comité del Desfile de Holyoke, Gran Flotador Colleen”Casa de Emma”. ¡Felicitaciones a los estudiantes y al personal que trabajaron tan duro en este proyecto! Echa un vistazo a las fotos de algunos de los contingentes de HPS en el Holyoke Sun. Noticias de atletismo: “Con un segundo puesto de Tyler Guertin y un octavo lugar de Ian Beauregard, en los campeonatos de PVIAC, el equipo fue sin duda el más formidable del área. Finn Lubold, Guertin y Beauregard también lograron clasificarse para que se reúna el estado: una tarea difícil entre el resto de los lanzadores en el estado “. Lea más en el artículo de El Herald titulado The Holyoke High Throwers ’20- (Los Lanzadores de Holyoke High ‘20) por Jack Shea. ¡Convocatoria de donaciones! Ethan Ramoth, un estudiante de 8vo grado en Peck y un Embajador Del Proyecto 351, está organizando una colecta de ropa a través de la organización sin fines de lucro Cradles to Crayons Massachusetts para niños que viven en áreas de alta pobreza. Ethan está buscando ropa y calzado para niños nuevos y de buen uso, y ha establecido lugares para dejarlos en Peck School, Metcalf School y E.N White School. El viaje se llevará a cabo hasta el viernes 5 de abril. Willie Emanuel López también es un embajador del Proyecto 351 que también está haciendo su Servicio de ropa de primavera. Sus contenedores de colección se encuentran en la escuela McMahon. El objetivo del Proyecto 351 es “unir a diversos embajadores de servicio de octavo grado de todas las ciudades y pueblos de la Commonwealth para un año inspirador de servicio comunitario, desarrollo de liderazgo y enriquecimiento”. El Sheriff Nick Cocchi visitó la Escuela McMahon el viernes con su perro de terapia Brooklyn. Mientras estuvo allí, juró a los estudiantes como oficiales honorarios del sheriff. ¡Los superhéroes de la Escuela Morgan dominan el MCAS! Desde el viernes pasado hasta el final del MCAS, la Escuela Morgan está teniendo un tema de superhéroes para apoyar a sus estudiantes de 3er y 4to grado que toman el MCAS. Todos han estado trabajando juntos para que sus estudiantes se entusiasmen con atacar la prueba. ¡Echa un vistazo a la página de facebook de la Escuela, Morgan Jags, para ver más fotos! I Touched A Brain! -(¡Toqué un Cerebro!) – los estudiantes tuvieron la oportunidad de tocar / observar cerebros de ovejas, mientras que los educadores dirigieron una discusión sobre las funciones generales de ciertas regiones del cerebro y lo que podría suceder si hubiera daño en esas regiones del cerebro (incluso hablar sobre la importancia de usar cascos y qué sucede cuando alguien tiene una conmoción cerebral). Train Your Friends! – (¡Entrena a Tus Amigos!) – los estudiantes usaron la premisa de “condicionamiento operante” (una técnica que se usa a menudo en la investigación con animales acerca de la cognición y la motivación) para entrenar a un compañero sobre cómo realizar una determinada tarea utilizando un refuerzo positivo en lugar de instrucciones explícitas. Aprendieron sobre la dopamina y el aprendizaje por refuerzo, así como el concepto de “neuronas que se activan juntas” para analizar cómo la práctica ayuda a aprender una nueva tarea. The Synapse Game! – (¡El juego Synapse!) – los estudiantes jugaron un juego especial de captura con bolsas de habichuelas como una forma de aprender acerca de la señalización sináptica química. Aprendieron cómo el alcohol, la nicotina y la enfermedad de Parkinson afectan cómo se comunican nuestras neuronas. Go To Sleep! -(¡Ve a Dormir!) – los estudiantes probaron los límites de EEG, aprendieron cómo medir las ondas cerebrales y discutieron cómo usar esta información para estudiar el sueño y la memoria. Aprendieron por qué el sueño es importante, especialmente durante la adolescencia. Conversación con el Autor Serie con el Comisionado de Educación Superior de Massachusetts Carlos Santiago, viernes 19 de abril de 2019 a las 5:00 pm en la Biblioteca Pública de Holyoke – El Comisionado de Educación Superior de Massachusetts, Carlos Santiago acaba de publicar una nueva edición de su libro, los Puertorriqueños en los Estados Unidos: Un Retrato Contemporáneo, que ofrece “un retrato completo y contemporáneo de los casi 8 millones de Puertorriqueños divididos casi en partes iguales entre la propia isla y en todo el Territorio Estadounidense y Hawai”. Esperamos que tenga un fin de semana agradable.